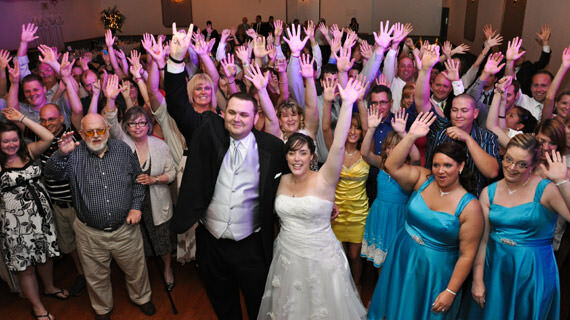 On Saturday June 23rd 2012 we were at Salvatore’s Banquet Hall in Pittsburgh Pennsylvania. The event was a wedding reception for Robert and Laura Kroner. Robert and Laura were married in a 2:00 pm wedding ceremony at St. Pius X Roman Catholic Church in Brookline. Guests began arriving at Salvatore’s Banquet Hall shortly after 3:30 pm were they enjoyed cocktails and appetizers. At 4:30 pm were formally introduced the bridal party into the hall and guests enjoyed a delicious meal that was prepared by the culinary staff at Salvatore’s. Through out the remainder of the evening, guests danced to the sounds of DJ Pifemaster. The wedding reception lasted until 9:00 pm.